We are delighted to welcome author Clare Helen Welsh to Story Snug. 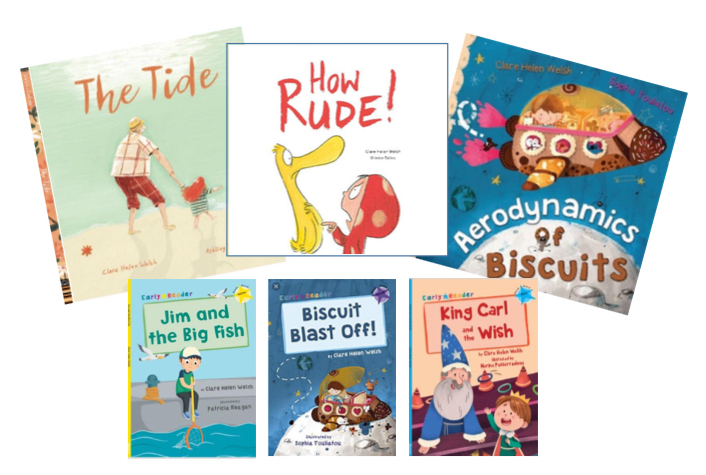 Clare has joined us as part of her blog tour to celebrate publication of her newest picture book, HOW RUDE! 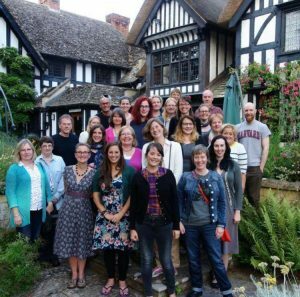 Five years ago Clare joined SCBWI and she’s given us a fascinating insight into the role that being a member played on her road to publication. One of the best things I ever did, where my writing is concerned, was to join SCBWI. For those of you that haven’t heard of SCBWI, it’s an international organisation that stands for the Society of Children’s Book Writers and Illustrators. But to me, it means much, much more! S is for SUPPORT – My membership to SCBWI British Isles began in January 2013, when writing a children’s book was just a pipedream on a New Year’s Day ‘To Do’ list. SCBWI and its many members are the loveliest, most supportive bunch of people you could ever wish to embark on a new challenge with. Facebook groups, twitter threads, face-to-face network meetings, an online magazine, local and national events… have all been an invaluable source of advice and information. Whether you’re searching for a critique group, advice on a contract, writing a query letter, figuring out which agents or publishers would be the best fit for your work… SCBWI is a lifeline. It’s also comforting to know that at least one other person has been through, or is currently going through, the exact same thing as you. Plus, there’s always a whole host of other people wishing you well. C is for CRITIQUES- Getting feedback on your work is incredibly difficult in today’s industry, yet it’s essential for progress. Joining SCBWI has given me access to online and face to face critique groups, without which I surely would not be published. Critique partners have taught me everything I need to know about characters, plotting, structuring a text, writing synopses and so much more, which inevitably helped me meet my now agent, Alice Williams, and the editors that I am now lucky to work with. (BTW I still have A LOT to learn!) I have also found critiquing other people’s work helps me be more reflective of my own. If you’re lucky, your critique partners will also become friends. Mine definitely have. B is for BUDDIES! Of course, B could have been for books, too! 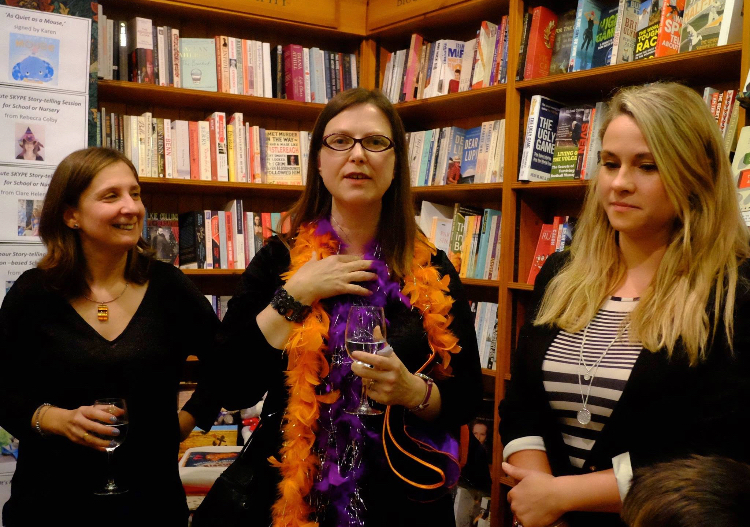 (Book birthdays, book launches, book chats, book recommendations, book reviews, book tours… books, books, books!) But I have met so many wonderful friends through SCBWI I couldn’t not give them a mention. No matter what time of day your book brain comes alive, there is always someone to chat to. I’ve heard it said before that children’s writers and illustrators are a thoroughly friendly bunch, and there’s certainly many welcoming people to share your journey with in SCBWI. They really can help you find the sparkly, silver lining in the toughest rejections. And other equally important agony aunt stuff too! Here I am looking terrified with fellow book launch buddies, Karen Owen and Rebecca Colby. As an aside, if you’ve joined SCBWI and are a bit unsure about introducing yourself, volunteering is a great way to start. When I first joined SCBWI I volunteered as joint celebrations editor for the online magazine Words and Pictures. Volunteering is a great opportunity to chat with and get to know other authors and illustrators. W is for WINNING- SCBWI continually finds ways of keeping me positive on what is, let’s face it, a rollercoaster of wonderful highs and challenging lows. There are many, many opportunities for you to push yourself, write to a deadline and succeed. Grants, scholarships, slushpile challenges, awards… In fact, one of my first SCBWI wins was a scholarship, in honour of writer, Margaret Carey, to attend the annual SCBWI conference. I applied for the scholarship, not really thinking I had much of a chance, but was thrilled when I found out I had been chosen. I was also nominated for the Crystal Kite award in 2016, which was particularly special because it was voted for by SCBWI members. SCBWI’s online magazine, Words and Pictures also has a Celebrations feature, for sharing successes and welcoming new members. If you haven’t seen it, you must. It’s a great dose of the ‘feel good’ factor, helping you celebrate all successes (big and small). Without this encouragement, I fear I may have given up on my dream long ago. This picture was taken at the Mass Book Lauch in Winchester with my first picture book, Aerodynamics of Biscuits, illustrated by Sophia Touliatou. I is for INSPIRATION- For me, there’s nothing more inspiring than seeing friends, members and others succeed and hearing first-hand how their writing journeys began. One of my favourite parts of the Annual SCBWI conference in Winchester is listening to the key note speakers. If you haven’t been to the SCBWI conference, it’s a wealth of information and inspiration for both unpublished and published writers and illustrators. Last year’s keynote speakers were the amazing Liz Pichon and Alex T Smith. I loved hearing that their big breaks weren’t necessarily their first books and also about how their perseverance and love of their craft led them to where they are today. 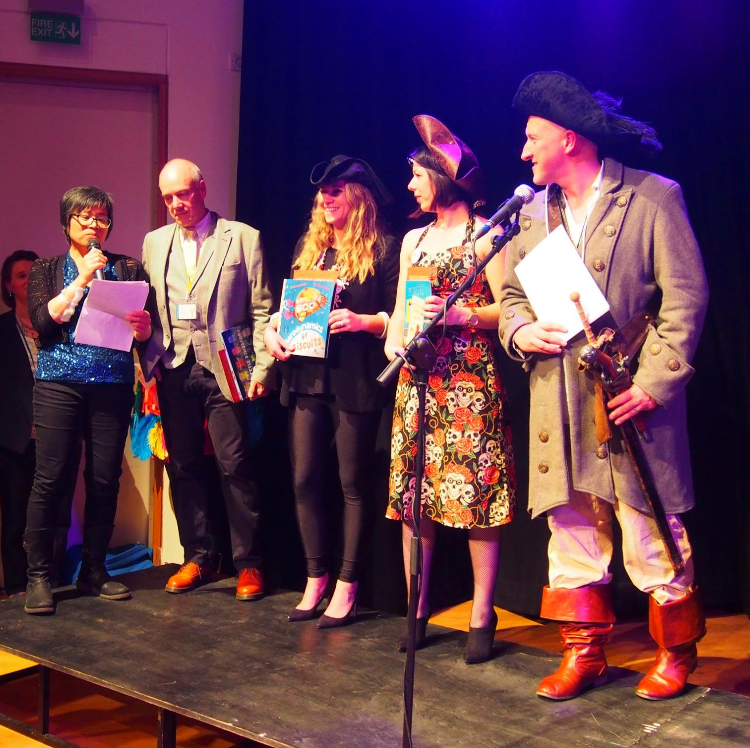 So to summarise all this, without a doubt, I would not have achieved all I have if it hadn’t been for the support of the SCBWI and the fantastic opportunities the organisation provides for writers. To anyone thinking about joining, give it a try. 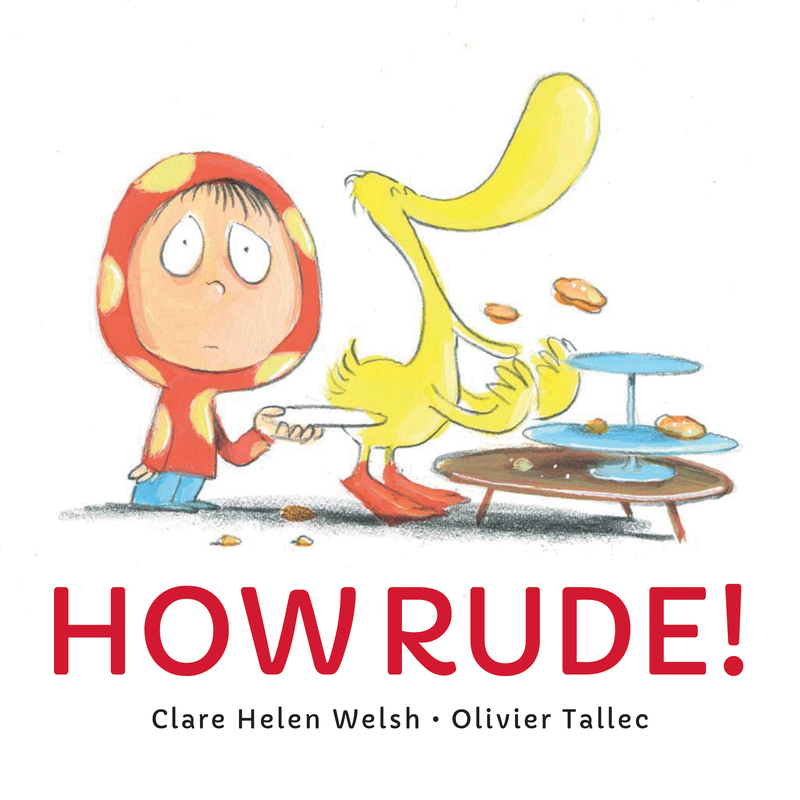 Huge congratulations on the publication of ‘HOW RUDE!’, Clare and thank you so much for telling us about SCBWI’s support throughout your writing journey. I am also a member of SCBWI and as well as attending several events, conferences and workshops I have made lots of friends who really support my writing aspirations. If you are serious about becoming a children’s writer or illustrator, it is a fabulously supportive organisation to be part of. Clare is a primary school teacher and children’s author who lives in Devon with her husband and two children. 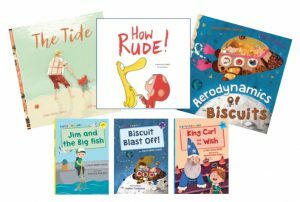 She writes a range of different picture books, including funny and quirky and sensitive and emotional, but always hopes her books bring a little added something to story time. She also writes early readers for the hugely successful Maverick Early Reader Scheme. How Rude! publishing on October 4th is available to pre-order here! She is represented by Alice Williams at Alice Williams Literary. HOW RUDE! : Duck barges into Dot’s house and displays a complete lack of manners when Dot offers sandwiches and drinks. Dot’s anger increases until Duck spies the cake. Quick as a flash Dot seizes the opportunity to teach Duck a lesson which leads to them both apologising for their behaviour. HOW RUDE! is told completely in dialogue and despite the fact that we don’t condone Duck’s rude behaviour we do find the story very amusing. Dot, Duck and their tea party are splashes of colour on a predominantly white background and this is a brilliant story to initiate conversation about manners and how to behave when you are a guest in somebody’s house. 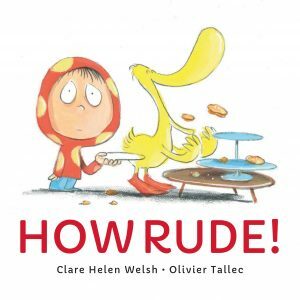 Clare is very generously giving away a copy of HOW RUDE! to those of you with European addresses but due to a delay at the printers the giveaway will now go live towards the end of the month. Keep an eye on Twitter for more details.